I was surprised, and tickled, to find that a little English Country dance I wrote quite some time ago was submitted to the newsletter of the Country Dance and Song Society of America – and published in the Summer 2009 issue. I haven’t been to a dance in a few years – not since the drive back from calling in Lansing on Thanksgiving Saturday became just too much for my 50-something energy level. (Okay, I could still do the drive. I just couldn’t make sense to my 8:00 a.m. class on Monday morning.) There is a bit of dancing here in Duluth, but it’s so different from all the country dancing I’ve done elsewhere that I couldn’t make the switch. The last month has brought people and music from that part of my former life back into focus. Not only did Jacqueline Schwab come to Duluth for a delightful concert, but that event helped me find out that some other country-dance oriented people were in the area, largely speaking. The College’s new wellness center has a beautiful little dance and exercise studio; it overlooks the creek, and one can often see the deer leaping through the woods. 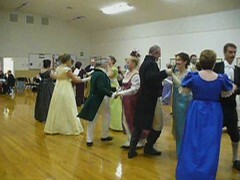 I’ve had half a notion to see about having a country dance class of some sort. Having found someone else in Duluth with experience in country dance organizations and music, it just might be the right time to look into it further. Country dance just seems to pop up when you need it most. Glad to see that the pictures and the video mean something to someone. Hope you get back on the dance floor. How life comes full circle!